The Gallup Independent has an article (available through the Newspapers collection in El Portal) on a donation from the local chapter of the Philanthropic Educational Organization International to the Children’s branch of the Octavia Fellin Public Library in honor of the Centennial anniversary of the chapter. 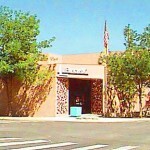 The PEO has a history of with the library in Gallup, as it’s members opened and operated the city’s first children’s library from 1920 to 1936, when it was turned over to the City of Gallup. So, what did they donate to the library? They asked Cory Eckert (who was, until recently, the children’s librarian there) what the branch needed: a new couch!